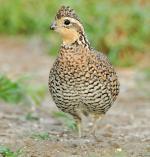 Black Francolin: Introduced to Hawaii in 1959, male has a black breast, and flanks with white spots, belly is rufous. Black head with rufous collar, brown crown and white cheek patches. Back and wings are brown scalloped. Lower back, rump, and tail black with fine white bars. Orange legs and feet. California Quail: Medium quail with distinctive, curled black head plume and white-bordered black throat. Breast is gray and belly is sharply scaled. The flanks are brown with white streaks and back is olive-brown. Legs and feet are gray. Alternates several stiff, rapid wing beats with short glides. 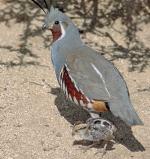 Chukar: Large, quail-like bird with orange-brown and slate-blue upperparts and breast, and black and rufous barred white flanks. White face has sharp black line extending to neck. Bill and legs are bright pink-red. Escapes danger by running. Direct flight with rapid deep wing beats. Common Peafowl: Peacock. Large pheasant with shimmering blue neck and breast. Face is white and head sports a fan-shaped blue crest. During courtship, long ornate tail is fanned out and held erect. Each tail feather has an eye. It forages and nests on the ground but roosts in the top of trees. Dusky Grouse: Large, chicken-like bird, dark gray to blue-gray plumage, red-orange eye combs, black squared tail with narrow pale gray terminal band. Patch of violet-red skin on neck surrounded by white feathers is displayed during courtship. Formerly (with Sooty Grouse) known as Blue Grouse. 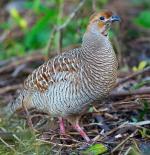 Erckel's Francolin: Introduced to Hawaii in 1957. Gray-brown overall with heavy streaks. Chestnut cap, black eye-stripe and forehead, gray cheeks, light buff to white throat. Gray back, tail and wings have fine brown bars. Black bill, yellow-gray legs and feet. Flight is low and fast. Gambel's Quail: Medium quail, gray upperparts and breast, scaled gray nape, black patch on center of abdomen, black head plume, white-bordered black face, cinnamon-brown crown, buff underparts, flanks streaked dark chestnut-brown and white. Alternates several stiff wing beats with short glides. 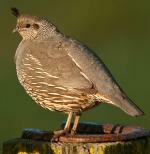 Gray Francolin: Introduced to Hawaii in 1958. Buff-brown overall with barring, finer on the underparts and heavier on the upperparts. Brown crown, nape. Buff to orange-brown face, cheeks. Buff throat, bordered below by a narrow black stripe. They are fast runners and prefer to run when threatened. Gunnison Sage-Grouse: Recognized as a species in 2000. Large grouse, mottled gray-brown overall with white breast, black face, chin, throat, bib and belly. Black bill. Yellow eye combs and long black filoplumes on neck show when courting. Brown tail feathers are long and pointed, with white bands. Himalayan Snowcock: Very wary ground dweller, white face, throat outlined with chestnut stripes, brown collar around neck, gray-brown overall, tan streaked upperparts, white undertail coverts, gray bill, orange-red feet and legs. Flies down mountain each morning, walks back up, eating as it goes. Kalij Pheasant: Native to India and Pakistan. Glossy blue-black overall, face has bright red wattles. 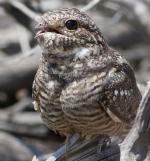 Crest, breast, and sides have long white to gray-brown feathers. Feathers from mid-back to rump edged in white, giving a scalloped appearance. Tail is long and black. Legs and feet are light tan. Ring-necked Pheasant: Large, chicken-like pheasant with metallic-brown body, iridescent green head, white neck ring, and bright red eye patch and wattles. The tail is very long and pointed. 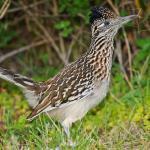 It was first introduced to California from Asia as a game bird in 1857. Very popular bird for hunting.